A child’s early years before they start school are fundamental to shaping their life chances. Children do better at school if they start well - successful transition to school leads to better attendance, adjustment, engagement and achievement. Parents play the most important role as a child’s first teacher in these foundation years and throughout life. Many things which families do so that children thrive help their learning as well - healthy eating, being active and showing affection. Parents have the biggest impact on children’s learning when they help children to believe in themselves and to enjoy learning new things. Children learn by doing, through touching, tasting, smelling, seeing and hearing and through sharing their understanding of these things with others - playing and talking! Play with your children whenever you can and encourage your children to switch off and just play and explore. 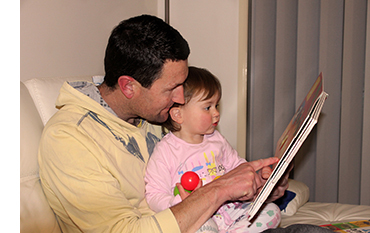 Use lots of different fun language - play name games, sing, recite names, play nonsense rhymes. Use things in the home to build experiences for touch, taste, and smell and talk about colour, smell, and shape. For example, how an orange is round, how an orange smells, how it feels outside and inside its peel, how it can be cut into pieces and how it tastes. You can try stringing beads, playing with clay or play dough, cutting with scissors and drawing with crayons to help children develop the skills they need for holding pencils and writing. Play ball games, run, jump, skip, and hop. Go out where children have lots of room to run, can explore and climb safely, and can play with different things like water, sand, sticks and stones. Use creative games like making up stories, pretending to be different people or characters, dress ups and puppet shows for fun, make believe play. Tip 2: Talk! Talk! Talk! Talk about everyday things as you do them at home - sorting the washing, setting the dinner table, writing the shopping list. Point out things you see when out in the car, shopping or walking in the park. Talk about street signs, patterns, numbers on houses or cars, plants and animals. Play ‘I Spy’ together. Read and count with your children every day. Children learn social skills by mixing with different people and trying new things with encouragement and praise. Talk to children about things they need to learn, ways they should act in different circumstances and what is expected of them when they are at home or outside of home (e.g. at the shops, at school). Help build independence, responsibility and skills for teamwork by involving them in shared family activities like preparing meals, setting the table and unpacking the shopping. Play team games. Help them take turns in the game, understand the rules of the game, and resolve arguments without fighting. Provide encouragement and praise. Tell them what they are good at. Tell them when you are proud of them. Thank them for their helpfulness. Talk about everyday things at home and their colour, shape and size. Match and label items e.g. breakfast cereal in a bowl - the bowl is round, is red, is heavy, is light. Particular toys and games help develop these skills such as constructing a block tower, following directions in a game, doing a puzzle, matching shapes and pictures, and stringing beads in a repetitive pattern. Discuss ideas and opinions. For example, talk to children about, and encourage children to make decisions themselves about, what to wear in different weather and for different types of outings.